How to Study when you’re Tired? Don’t we usually look up for different excuses of not to study? Well, some might agree to this whereas some might not. “I’m too much tired to study.” Most of us have used this statement and made excuses not to study. Generally, in today’s era, we all know the importance of education and its role in a person’s life. Some of the people study to score well, but for some studying is just a compulsion because they don’t have any other option. Yes, you cannot study the whole day as people do get tired. Studying is never productive if you’re too tired because it is useless to study if you’re tired as nothing will go in your head and you’ll end up feeling miserable and at the same time start hating studies. Not studying is also considered to be a problem at the same time and this is because it can destroy all of your habits and also it will prevent you from studying. Also, it will become your main excuse too and you won’t be able to follow your daily routine of learning things. The time you waste on taking useless decisions you could spend them studying appropriately. In order to decide when to study or how to study if you feel tired, all you can do is create 3 simple rules and make sure you keep in mind to follow them because it will be of great importance and you’ll be able to manage your studies and yourself too. Although, you have an option to create your own rules too. If you didn’t study yesterday then you’re surely developing the pattern of avoiding studies and that’s bad. You’d rather study just for time pass each and every day rather than developing a habit of not studying. This might help you in planning the next day. So, if you plan to study tomorrow all you can do is either take off today and plan studies for the next day and if you feel you won’t be able to study tomorrow you can study today. Therefore, you should be clear in whatever you do because only then you can plan. If you don’t wish to study then it usually means that you should study. Otherwise, you will find different reasons to avoid your studies. Tired much? Can be considered to be a fine excuse but this excuse cannot work for quite long. So, you need to first decide whether you want to study or willingly want to study or not because there are most of the students out there who don’t wish to study at all and that’s okay because it’s their choices. Did you sleep for less than 75% of the usual time? Usually when you make an effort to sleep more than 8 hours at night and most of the time you succeed in doing the same. But when this doesn’t happen you automatically get tired, so it is considered to be a valid proof that you get tired and if this happens you get another excuse of skipping your studies. If you get to know the answers of all the three questions you’ll be able to skip your study to further continue your studies. Generally, you can draft basic rules and regulations in order to further follow to ensure that you study regularly and it will allow you the freedom in order to take a day off once in a while. You will get to know that making rules and guidelines is considered to be one of the most important factors in taking the right decision and it will keep your grades high too. All of us have been through this stage. Try to study but then our eyelids droop and our brain starts to feel quite fuzzy. 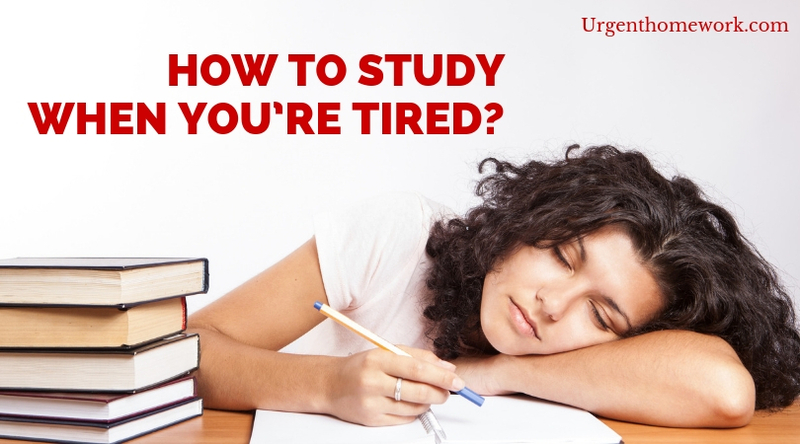 So, here are some of the ways that show how to study when you’re tired and one definitely shouldn’t miss it. Well, if you won’t study a day or if you skip studying one day, the world won’t end. Secondly, you need to first sort out whether you’re feeling sleepy or feeling tired or exhausted. If you found out that your study isn’t critical and you’re sleepy then your time is not used wisely and hence there is no point in also reading that paragraph again and again because nothing is going in your head. Thus, if you’re studying isn’t critical and you’re tired then you need to make a decision. All you can do is either step away from your desk and then wake yourself up or rest now so that you can come back and study. It is important to get good sleep because it turns you into a new person. You need to ensure that you’re not feeling tired because then it will become an excuse not to study. you need to be clear with your routine and you need to decide whether you’re a night owl or an early riser. That eventually means are you most productive in the morning or in the evening. This is because once you decide only then you’ll be able to study and your brain will function accordingly because then you’ll be able to study thoroughly and also will plan for the day. If you feel tired on daily basis then you need to adapt your study schedule in order to remain fit at the same time. The main element here is to actually study or try studying during the most productive hours. Sometimes it becomes difficult with the work and family responsibilities in order to rearrange your study schedule but if you have an agenda you’ll be able to study appropriately without any tensions in your life. Thus, you can also find areas in which you are flexible in order to make the most out of it. when we usually get tired our brain eventually finds it quite difficult in order to complete different tasks with the high cognitive weight this eventually means that you need to use a lot of brain power. This happens because it sometimes becomes quite difficult to understand this basic concept even when you’re sleeping or is sleep deprive and this is that phase of life where your mind or brain is totally blank and you still try to study. If you’re too tired to take notes all you can do s spend some of your time in order to take down notes and if you get bored of doing the same thing, again and again, you can do your household chores and at the same time errands that might free up your most of the time in order to study tomorrow. You need to set up the document for the very next notes or essay and email your tutor for the same asking questions about different topic and approach that is to be used at the same time. All you can do is basically file up your notes and clean your desk in order to work out your priorities for the week or so. This will eventually help you to stud even when you feel tired. So, if you are finding it difficult and want to get some of the work done as soon as possible then you need to study hard but it is up to you if you need to take breaks in between as little breaks are important too. You need to try for 30 minutes after having a break for 15 or you can study for 60 minutes then take the 30 minutes break. It might not seem like you’ll initially get much in order to get too many breaks but then it is better than eventually not doing anything today in order to feel great. You need to eventually break in order to get some of the fresh air and you need to cook some great food. You can also call a friend or have a bath and you can also pass your time by watching your favourite show. You need to ensure that you study with no distractions and you’ll be surprised in order to know that you can achieve all of these short sprints. Although, you try to overcome and push through what you face at the same time it is considered to be important in order to tackle the major problem that is being hidden. This is because it is something one should work on if he or she is a night own i.e. loves to study in the night. You’ll come across some of the times where you’ll find out that your sleeping schedule is changed drastically and at that time you’re working or studying because that’s how you follow your daily routine. But in order to get the right sleeping schedule and enough sleep it is important for you to know that minimum 8 hours of sleep is important in a day and to further remain fresh and not tired it is important for you to get enough sleep otherwise you will remain tired most of the time and it will lead to problems because you won’t be able to catch up with your studies then and this will result in getting low grades. If you want to get enough sleep still not able to get them here are some of the tips you can try in order to get enough sleep. Make your room a little darker – Do you know the fact? That a small amount of the artificial light can eventually disrupt your sleep pattern and so it is better to drop down your curtains and keep all of the electronics sides and make your room a bit darker in order to get a peaceful sleep. Make sure there are no backlit screens 60 minutes before going to the bed – So, this is considered to be one of the most difficult things in order to use the laptops or the tablets and also the smartphones in order to study. But it is worth it and at the same time, you can also adjust those 30 minutes of yours at first. Though, there are some of the workarounds that could eventually help at the same time. There are different apps for your devices in order to further reduce and also block this blue or red light that usually disrupts your sleep. You can make use of apps but at your own risk. Eliminate the caffeine from your life – there are people who don’t prefer having it in the evening or mid-afternoon. Though, the half-life of the caffeine is about 5-6 hours and so is the half the amount is still considered to be the system usually after the 6 hours. You need to set the caffeine curfew or eliminate the caffeine from your life in order to further see if this makes any difference in your sleep and life too. Make sure you don’t interrupt the standard sleep cycle – Usually, normal sleep cycle last for about 1.5 hours and do you ever wake up before your alarm and at the same time feel that you are already awake and then you go back to the sleep after 30 minutes? Therefore it is compulsory to set your alarm in order to work with your sleep cycle and for that you need to try for the 7.5 hours and if you’re tired till then you need to fit in for 9 hours at least and if you get that normal sleep cycle again you’ll be able to get into the normal sleep routine and it’ll help you in your studies and also in getting enough sleep too. Make sure you get natural light during the day – Sometimes if you remain at your home you’ll become homesick and this is because each and every person require some fresh air or an outing. You can try to go out for a walk at the lunchtime or you can also step outside in order to go for a morning walk and get some quick break. Sometimes natural daylight assists you in order to make sure that the right hormones are released in a whole day and this could further help you in order to sleep better later onwards. So, if you feel tired too much or rushed off your feet then you really need to look at your schedule and see what needs to be changed. It is considered to be quite normal if you feel this way but then you shouldn’t feel guilty if you fail to maintain all of them at one go. Although, you can take out time for all the important things in life as you get 24 hours in a day and also 1/3 of them you use for sleeping. In order to further prevent burnout, it is considered to be important to further work out on all of your priorities in order to spend your time on those people. Thus, you need to look at your calendar and then see what needs to be modified or removed from your schedule so that you feel less tired. Thus, if you find a certain hobby to be exciting it doesn’t always mean that there is time for something new. You can eventually reel your social life too at the same time. Instead of going for the night outs or for the day trips for your friends you can eventually switch some of those further for the hangouts or the dinners and you also can go for a fitness regime at the same time. You need to have the honest look at your schedule and then work out on it and see whether it needs to change or not in order to get further access to focus on the important part only. Although it sometimes becoming tough in order to study with other different commitments and there will always be those times when you majorly feel tired most of the tips might eventually assist you to work out whether you’re tired or not and for that you need to wake up and you need to further make more changes about the same time. However, each and everyone out there eventually wants that small edge that can eventually put him or her and is different than others. Though, one such area is that it is important in order to squeeze into other effective hours and also into different study schedule. What if you further stretch all of your study hours as it should be initially efficient and effective. It is tough though and no doubt but then it is succeeded at the same time. If you study on the daily basis it will further increase your output on daily basis. Therefore, if you are feeling tired it doesn’t have a signal in order to end productivity. You can at the same time you need to study if you’re eventually tired and at the same time you can do a great time.